Predicting where lightning will strike may be pretty tricky, but what about where lightning will flash? 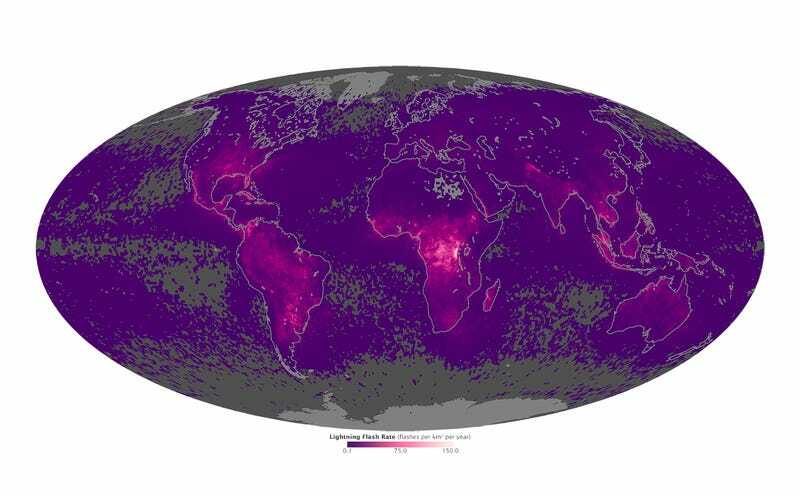 This map from NASA's Earth Observatory takes data from 1995 - 2013 to show us the global hotspots for lightning. As you can see, lightning rates over land are much higher than over water, with the heaviest areas seeing rates of up to 150 flashes per kilometer per year. But, while that rate may sound deceptively low, many of those same areas are seeing the majority of their lightning in a single season, monsoon season, while the rest of the year is relatively quiet making for some very impressive — if brief — stormy displays.